Gronbek Security is able to service your home or business, wherever you are located throughout Perth. Our professional locksmiths, with 8 fully-equipped vans service all suburbs in the greater metropolitan areas from Yanchep to Mandurah to Mundaring and including Rottnest. We can assist whether you are a business in Joondalup, right next door in Fremantle or need our service on Rottnest. 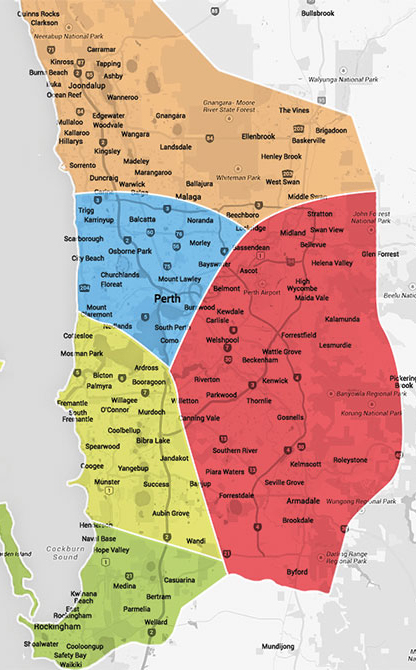 Our flexible service also covers Regional large commercial customers in WA country towns and minesites. With our long-term industry experience, our locksmiths Perth can identify weaknesses in your home’s security. Every home is different and as Perth locals, we understand the security requirements for your suburb and home. We have provided security solutions for large homes in Cottesloe, unit blocks in South Perth and family homes in Joondalup. When considering security for your home or business, Gronbek Security has the experience and quality products to provide you with the best protection for your family and valuable assets. 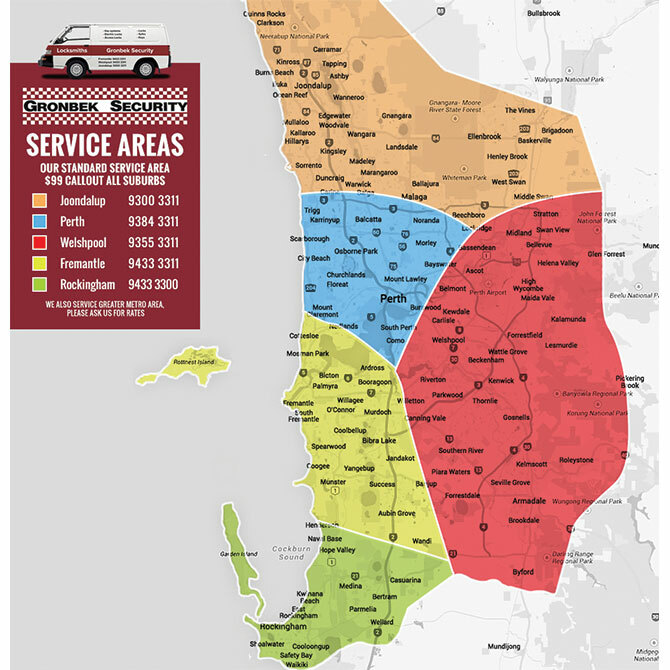 Our stores in Fremantle and Welshpool ensure we are well-placed to service the metropolitan area. Yes, we can assist you in an emergency and can divert one of our mobile locksmiths to attend your home and quickly complete your request. Whilst in an emergency, it can be tempting to choose the first locksmith you come across but your safety and security is paramount. We offer competitive call out fees, with quality products and professional installation so you can secure your property. We provide a fast turnaround on quotes and completion of work with respect for your tenants and can service all your residential and commercial properties, regardless of where they are located. Gronbek Security has the capabilities to provide regular servicing and maintenance and with multiple vehicles, can service more than one property at a time. We can also assist facilities managers for commercial buildings, with improved security for commercial areas such as Wangara, Joondalup and Cockburn. Trust your security to your local, experienced and fully licensed professional locksmiths. Call Gronbek Security on (08) 9433 3311 or send an online enquiry to find out more about the services we can provide. Trust your security to the Perth locksmith company with the track record and reputation to provide the best quality products and installation. We offer a competitive price on quality, commercial-grade products for both commercial and residential security. If you’re not sure what you need or feel your home or business security could be improved, our team of Perth locksmiths can offer advice on a solution to suit your needs and budget. It may be as simple as choosing a new lock for the front door or designing an integrated security system. Our Perth locksmiths have been in the business a long time and are often asked the same questions. How can I prevent a break in? Do I need to change locks? Is my home secure? We can answer your questions so you can be informed about your security and safety. 4.9 out of 5 based on 27 user ratings.